Classroom clickers: they’re clunky,easy to lose, and just plain problematic. While clickers can be great classroom tools, there is simply no reason they need their own hardware.These days students can do the same plus more just by downloading an app on their smartphones. Each semester, students shell out $30 in addition to their textbooks just to participate in class. Why so expensive? Not only are students buying the software, but they’re also buying the plastic casing around it. Students can download clicker software for free on their Android or iPhone, or access it for free via any device with a web browser –no plastic necessary. Hardware clicker are just one more thing for students to remember…or more accurately, forget at home, lose in another classroom, or break just about anywhere else. A student’s participation and attendance grade should reflect they show up and participate, not whether they bring a clunky piece of plastic. nClass removes redundancy–students only have to take care of the smart phones and laptops they bring with them anyway. In order for your class to use those hardware clickers, you must integrate you clicker with a Powerpoint. That means, in addition to making Powerpoints, printing handouts, teachers must also take to time to make sure the technology is configured with the lesson. These clickers add minutes of hassle to your daily prep work, not to mention the time wasted if the integration fails some time during class. nClass uses its own, fully-integrated software–no Powerpoint required. You can feel comfortable that our software will pop up on the class projector or smartboard, as well as on each student’s smartphone, as soon as you log in and start a session. Teachers like to test students in a multitude of ways, shouldn’t their edtech reflect that? 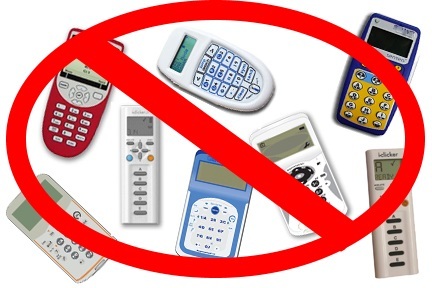 Unfortunately, teachers using hardware clickers are stuck with a type of test best associated with recall and that is vulnerable to process of elimination. With nClass, you can make your daily quizzes multiple choice or open-ended, allowing you to test your students’ critical thinking skills as well. Have you ditched your hardware clicker yet? Let us know why in the comments.